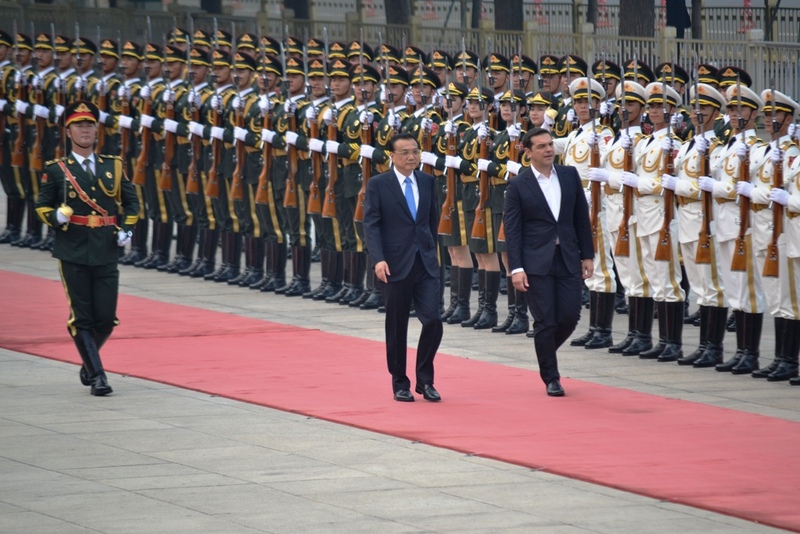 The Greek Prime Minister will hold important discussions during his visit to Beijing on May 12-16, where he will participate in the “One Belt One Road Summit”. According to information other than meeting with the Chinese leadership where he will co-sign the Cooperation Plan on Key Areas 2017-2020, Alexis Tsipras is reportedly expected to meet with Turkish President Racep Tayyip Erdogan, IMF Director Christine Lagard, the UN Secretary-General Antonio Guterres, possibly even with Vladimir Putin as well as a host of entrepreneurs. It is worth noting that the Greek Prime Minister will be accompanied by Greek Foreign Minister Nikos Kotzias. Alexis Tsipras will also have the opportunity to address three speeches to the leaders and businessmen who will take part in the two-day events of the One Belt One Road Summit on May 14-15. More specifically, the three-year memorandum of cooperation to be signed between Greece and China will be in the following key areas of investment cooperation: transport, energy, telecommunications, shipbuilding, infrastructure and logistics. In addition the specialization of sectoral investment co-operation in co-operation with state and private enterprises, and in encouraging the financial institutions of both countries to provide support to selected projects with a view to rapid implementation will be discussed. With Christine Lagarde, a key topic of discussion will be the specialization of medium-term debt relief measures in order to reach a final agreement between the IMF and Germany, which will lead to Greece’s integration into the EC quantitative easing program (QE). With Recep Tayyip Erdogan the issues to be discussed will concern the two countries, such as the refugee crisis, the Cyprus problem as well as the Summit between the two countries that is expected to take place in Thessaloniki. With Antonio Guterres he is expected to discuss the latest developments in the Cyprus issue, refugee crisis and the instability in Balkans, while with Vladimir Putin an attempt will be made to re-open the relations between the two countries after the failed visits to Moscow and St. Petersburg in 2015. 28 heads of state and government leaders, including Russian President Vladimir Putin, Turkish President Recep Tayyip Erdogan and Greek Prime Minister Alexis Tsipras, and over 80 leaders of international organizations including UN Secretary-General Antonio Guterres, World Bank Group President Jim Yong Kim, The Managing Director of IMF Christine Lagarde, have confirmed they will attend the Belt and Road summit in Beijing on May 14-15. Chinese Foreign Minister Wang Yi said Chinese President Xi Jinping will host the round table summit of the leaders. Dubbed ‘One Belt, One Road,’ the plan is to revive an ancient trading route stretching from Asia to Europe. Beijing and Moscow have also indicated they have reached a consensus on integrating China’s ambitious One Belt One Road plan with the Russian Eurasian Economic Union. “China has invested more than 50 billion US dollars in countries along the Belt and Road since proposing the initiative in 2013,” said He Lifeng, head of the National Development and Reform Commission, in early March. China’s One Belt, One Road Initiative aims to create a modern Silk Road Economic Belt and a 21st Century Maritime Silk Road to boost trade and expand its global influence. The 6,000-kilometer road linked ancient Chinese, Indian, Babylonian, Arabic, Greek and Roman civilizations. A map unveiled by the state agency Xinhua shows the Chinese plans for the Silk Road running through Central China to the northern Xinjiang from where it travels through Central Asia to Kazakhstan and to Iraq, Iran, Syria and then Istanbul in Turkey from where it runs across Europe Cutting across Germany, Netherlands and Italy. The maritime Silk Road begins in China’s Fujian and ends in Venice, Italy. In 2014, China announced a $ 40 billion Silk Road Fund to strengthen connectivity in the Asia-Pacific region. After the China-led Asian Infrastructure Investment Bank, Silk Road could be the second China-led project in recent months to attract a flurry of EU participation.